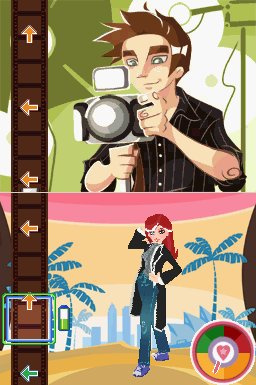 The life of a photogenic model is well known amongst the Nintendo Life team, and now Tivola is giving all DSi owners a chance to live the dream with Model Academy, a simulation game that sees you progress from girl in the mall to World Supermodel. The question is, does this title provide a fun experience, and can you walk the walk? 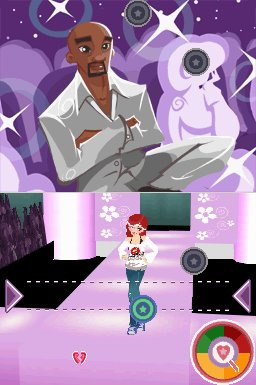 The storyline in Model Academy is simple: you play a young girl wandering the mall, dreaming of a model’s life in which to utilise your passion for fashion. A man called Nick sees you gazing longingly at a dress and strikes up a conversation, and before you can reach for the pepper spray he introduces himself as a model agent. You follow up the invitation to visit his agency and you gradually meet John the photographer, Gigi the make-up artist and Brian the personal trainer. By working with this team you will start as a humble model and work your way through photo shoots, catwalks, gym workouts and make-up sessions. These characters are all caricatures of the fashion industry with an abundance of spiky hair and expensive clothes, but sadly the script isn’t particularly good, lacking any wit or humour, which is what it needs in the absence of interesting plot developments. The one-dimensional characters are matched, unfortunately, by equally simplistic gameplay. 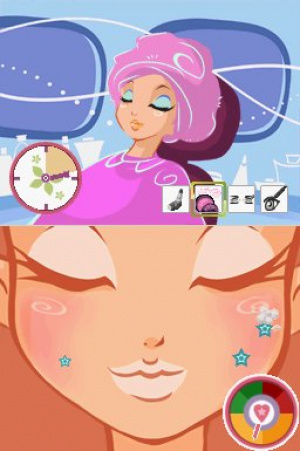 The activities in this game are performed through a series of minigames, some of which are played solely with the touchscreen, such as the salon and catwalk. The salon has a variety of activities to spruce up your image; you’ll swipe the stylus to apply face cream or join dots for a massage. Walking on the catwalk consists of a rhythm game, tapping circles as they enter an area at the bottom of the screen, like a fashion show Guitar Hero. Some of the minigames have the option to play with the directional pad, such as the gym where you tap a direction at the right time, or having to perform a similar action in the photo shoots. The problem with these mini games is that they are unimaginative and repetitive, with a lack of gameplay innovation to keep you interested, a fault that's exacerbated by the difficulty level. When creating your profile and character you can choose either ‘Easy’ or ‘Hard’. Easy difficulty is a walk in the park, while Hard yanks up the challenge significantly. Skilled players will beat the game in Hard, but less experienced players or young children may find Easy boring and Hard impossible; this title is crying out for a middle ground. As suggested earlier, the minigames can be repetitive, yet you will be playing each of these roughly 14 times in as many levels. Each ‘job’ consists of being given a brief, visiting the salon and gym, buying suitable clothes and accessories and then wearing these in a photo shoot or catwalk. As Gigi the stylist would say, it is rinse, wash and repeat. You will become very familiar with each mini game in your play through of about 4-5 hours, and they will more than likely become boring. Once you complete all of your modelling assignments and become a world famous model, there are a few features to offer some replayability. You can free-play a level of your choice, although it seems that you will have little hope of beating your high score due to the fact you’re wearing the outfit from the last level in the campaign. You earn fewer points as a result, and there is no way to find out what the correct outfit was for that job; you’ll need either spectacular memory or notes telling you what to wear and when. You can create magazine covers, in which you dress your model in the clothes and hairstyles that you’ve bought or unlocked throughout the game. Finally there is the ‘Nutrition Tips’ mode, a primitive guide to teach you about balancing meals; this feature has educational value for those who enjoy too many microwaveable meals. Tivola deserve some credit for the visuals in Model Academy. When starting the game you create a character and their 'look' using a decent 3D model. Animations of your character while walking or exercising may at times look a little bit like a puppet from Thunderbirds, but considering the limitations of DSiWare the animation and 3D modelling is decent. The rest of the presentation comes in the form of still pictures and text bubbles, and the eagle-eyed amongst you may spot the occasional spelling mistake in the text. In terms of sound, the load screen of the game recommends the use of headphones for a better sound experience; considering the repetition and less than inspired music in the title, we recommend the opposite. This is a title that is only likely to appeal to children approaching their teens, but even this demographic may find the problems in this game hard to overlook. The repetitive gameplay, irritating music and weak dialogue all detract from the experience. Some praise should be given to the 3D visuals in the game as well as the effort to include an educational feature on nutrition. 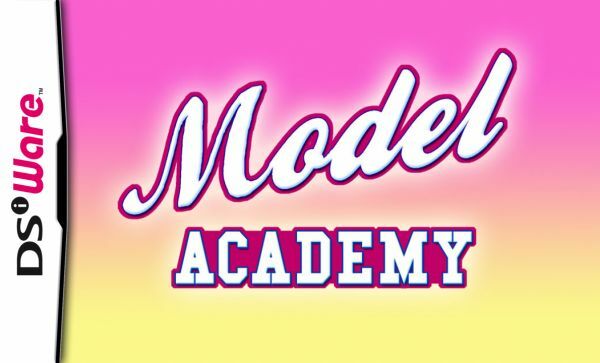 However, as a game this is simply lacking in the fun department, and it's this absence of fun that undermines Model Academy and makes it hard to recommend. I feel sorry for Thomas having to review this. Honestly, is there some abyss of ideas that some developers go to? The game ideas they get sometimes just make you wonder. This game made me anorexic. Whoa. This is really... odd. Yes I am pretty enough! ...AND YOU BETTER BELIEVE IT!!!!!!!!!!!!!!!! The only thing I like about this game is the banner pic at the top. @Zach - Thanks. I can honestly say that reviewing this game, due to the concept, was a fairly surreal experience. I did my best to give a fair appraisal as there are gamers out there who would consider a purchase of this kind of game, which is fair enough; each to their own! If I were a woman I think this game would come off as terribly offensive instead of just crappy. And there we have it! The end of DSiWare! I guess Nintendo was just slacking off on there games and mis-heard the developers? haha. All I can say is, I hope the 3DS eStore is DECENT. (or atleast better than DSiWare) little girls do not pay for nintendo points! Hmm...I dunno. It might be fun. I like how you have to do a little DDR kinda thing on the runway.